Q: Any practice recollections that you’ll never forget? ZW: The best practice we ever had was when Christian Peter got knocked over the head with his own helmet down in ‘The Pit.’ That was a pretty memorable one. That one, and when Joel Wilks got into a fight with a guy. The guy was hanging onto his back and Wilks is trying to run around and slam the guy against a wall to get him off his back. That was pretty funny. The overall funny one was my sophomore or junior year. We had this rule that if you’d gotten into a fight during practice you had to go into the locker room. That was Coach Osborne’s rule, “Hey, if you get into a fight, you’re out of here.” Of course, he makes the rule and the first week there’s like twenty fights with guys trying to get out of practice. (laughing) So after we all got into a few fights he decides, “Well, now if you get into a fight you’re going to have to run stadium stairs.” I don’t remember being in another fight after that. (laughs) Of course, the ones in the pit didn’t count. He actually had to see you get into a fight, so the stuff that took place in the pit was its own deal…that was just between Coach McBride and Coach Tenopir. But the ones on the field? As soon as he made that rule that you had to run there was never another fight on the field, I think. (laughing) Running stairs in your football pads is not a good thing. Q: Many say that practice was much harder than the games. Who did you go up against most frequently in practice? ZW: It depended, you know? A lot of times in the regular practices you’d end up going against Donta Jones and Dwayne Harris and Christian and guys like that. A lot of the practices were against scout team guys, too. So we did both. You pretty much went against everyone on the team who played on defense. Jared Tomich was a younger guy I used to go against quite a bit at practice. There was a lot of competition. Our D-Line still thinks they were tougher, but we got the best of them. Q: Do you recall when the defense made the switch to the 4-3? ZW: Yeah, my freshman year and sophomore year they ran the 5-2 and they went to the 4-3. They played so much faster. Instead of being a two-gap team where you took guys head on and you had to get rid of your block and make a play, it changed to where they were just in gaps shooting upfield -guys like Tomich and Wistrom and Donta Jones and all those guys- they were such good athletes that if you put them out on the end and just let them chase the quarterback around it was such a faster, more aggressive team. Instead of a team that read and reacted they were in your face making you react to what they were doing. And you could do that with a 5-2 defense, but that wasn’t the style we played. Our defense just got so much more faster each year. And they just kept recruiting guys who were faster and faster, too, it seemed like. Q: Do you recall your first winter conditioning team meeting after your freshman season in ’90? Some have talked about the ‘buy in’ during that meeting. Does that stand out to you? ZW: Yeah, when you’re young you don’t know how things were before that meeting, but I think there was definitely a perception that some of the guys there before weren’t the most ‘effort’ guys. I don’t know that, but I just think that a real interesting thing was that we obviously had talented guys, but we also had guys who worked really hard at the same time. So we didn’t just have guys who relied on their God-given ability; we all tried to get better every year. And as you saw these things happen, I think you not only saw a better level of player on the field, but you also saw a guy who worked harder. You saw both. Q: No stone was left unturned? ZW: Yeah, my sophomore year was Will Shields’ senior year and that’s when I really started seeing a difference. I could really tell between my sophomore and junior year that the intensity just really got turned up as far as offseason conditioning and competition. You could just see it. Every year the level of intensity in those offseason workouts just got higher and higher and higher. Q: Other than the guys up front that you faced daily, who stood out to you as making some real strides on the defensive side of things? ZW: Oh, you had Barron Miles and Ed Stewart… we had so many good players. All those front seven guys were just phenomenal. Doug Colman, he had a rock head. Then you had Cory Schlesinger who played twelve years in the pros as a fullback, which is unheard of. Abdul Muhammad on offense; he caught more balls than anybody, but he was 170 pounds soaking wet and you’d just see some of the blocks he’d throw in games. It was like our receivers were in some mad race to get downfield and see who could knock down the backside safety and stuff. You wouldn’t believe the stuff that we’d see on film. It just came down to the fact that we had guys who loved to play and they were all pretty talented. Q: I had a conversation with Coach Osborne about the fact that he didn’t like our quarterbacks running out of bounds, saying, in essence, “We aren’t going to play you ten versus eleven, we’re going to play you eleven versus eleven.” Do you recall hearing something like that? ZW: Yeah, you mean as far as the quarterback? 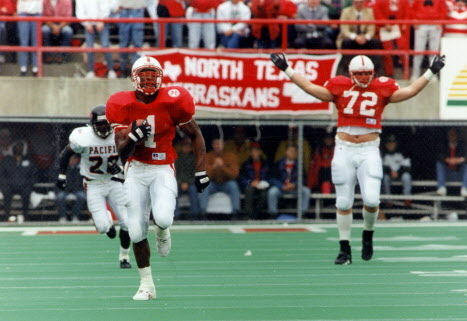 Yeah, the quarterback -when I played at Nebraska- was just like another running back…who would occasionally throw. I mean, Tommie was the toughest running back in the country. He was such a good runner. Q: I’m deviating here, but any other guys from that backfield you could talk about? ZW: You know, Lawrence was probably, to this day, the most naturally talented football player I ever played with. I’d tell guys in the pros that all the time and they’d be like, “No way.” And I’d tell them, ‘The guy could do everything. He could run over you. He could run around you. He’d catch.’ And when I was at Nebraska you never heard a peep out of the guy. I mean, the guy was quiet, very respectful to the older guys on the team, just an all-around great person to be around. You know, after we left he had a few problems the next year. And we were together in St. Louis for two years, also. ZW: Things just went downhill. Here was a guy that if the agents and the people with the money would have just left him alone, he would have been the best player ever. When you get that money and that posse hanging around you who want to spend that money for you it’s a bad deal. But I have nothing but good things to say about Lawrence Phillips. Q: Thinking back, what have you taken from these experiences these many years removed? What do you hold most close? ZW: I think being one of the fortunate ones, being able to play pro ball like I did, realizing that you really did have it that good while you were there. There’s no place to play football like Nebraska. I’ve heard some horror stories, a ton of stories from guys who played at other colleges and just hated their college experience. And you’d hear all this talk of how pro coaches were better than college coaches, but I’d put the Nebraska football coaches up against any of them as far as knowledge and as far as being a good person. I wouldn’t trade any player I played with at Nebraska or any coach with another from the pros. Q: Saying that, can you give me any insight into Coach Tenopir and his methods, how he taught you? ZW: One thing he was great at teaching guys was the fact that you had to depend on the guy next to you, because offensive line is a group deal. If one guy’s not pulling his weight the whole deal doesn’t work. And so he kind of taught that approach. And he wasn’t a yeller. I’ve been with so many coaches who swear and yell and this and that, but he would basically say, ”This is the way we do things: You play fast and you play physical. It doesn’t matter who’s across from you if you keep with these fundamentals: play low and keep attacking all the time, and you’ll do fine.” I remember little Kenny Mehlen one time playing Dana Stubblefield and just eating his lunch. And then Jim Scott, he probably weighed two-sixty and he was one of the better guys I ever played next to. Tenopir just got the most out of his players. And here’s another guy like Coach Osborne -like a father figure to you- and I think just taking the approach that “if you do this, this and this -and you might not get to play here because of your God-given ability- but you can make the most out of what you are given”. That’s the approach he took to coaching and I think it’s the only approach. At least it’s the approach that worked the best with me. Peer leadership, to borrow from a 1950’s media franchise, is a many splendored thing. It’s an often ambiguous term encompassing myriad styles and concepts and personalities: from Moses to Meir to McArthur to Martin Luther King, Jr. I had an epiphany of sorts when Zach mentioned, “the leadership came from the offensive line and the defensive line” of that time. We’ve heard the ages old saying, “It all starts up front in the trenches” a thousand times from radio and television talking heads, but it was not only the actions of the boys in the trenches that made an indelible mark on those Husker teams, it was their leadership in both word and action. You may have gotten that same impression from our earlier sit-down with Brenden Stai, but like any good pulling guard/tackle combo, Zach drove home the final blow and helped me to turn the corner on grasping a unique bit of insight. Because the offensive line opened up the holes and provided backfield protection, too, one can see how their on-field actions no doubt lent validity to their words in the locker room. I’m fairly certain we’ll hear of leadership concepts as we go further in my quest to answer the great Why and How of Cornhusker Football’s Golden era, and I hope to delineate the many facets of that leadership, also. Another bit I found remarkable was the mindset later displayed by the offensive line in their quest for dominance, the notion that, “it should never come down to a field goal, that we want to be the ones on the field controlling our destiny and not on somebody kicking a ball.” No offense to Byron Bennett and the whole covey of kickers out there, but if you can dominate, control, beat down and dismantle a team the way these guys purposed, the only use for place-kickers would be point after’s and kickoffs rather than nail-biting game winners with everything on the line. And I can appreciate their point, for who truly wants to expend such grandiose efforts toward a game’s endeavor only for success to hinge on a rounded shoe connecting with a round ball in the hopes it will travel a straight path? Not me. And not for the offensive line of those days, either.